The United States Geological Survey, a scientific agency of the United States government, reported a 3.3 magnitude earthquake in Plumas County on Sunday, Jan. 20, at 8:14 p.m. Looking past the North Shore Campground, the epicenter of the 3.3 magnitude earthquake on Jan. 20 was reported to be under the waters of Lake Almanor, not far from the outlet at Bailey Creek at a depth of 1.9 km (1.2 miles) below the lake bottom. The temblor, felt over a significant area in the Lake Almanor Basin, was even detected by some residents as far away as the town of Westwood. 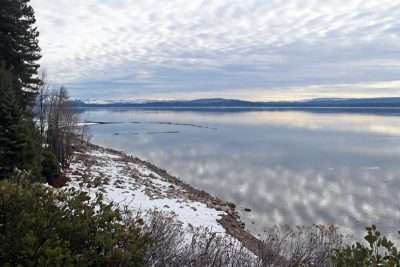 USGS said the epicenter was pinpointed under the waters of Lake Almanor just off the northern shoreline, not far from the outlet at Bailey Creek at a depth of 1.9 km (1.2 miles) below the lake bottom. 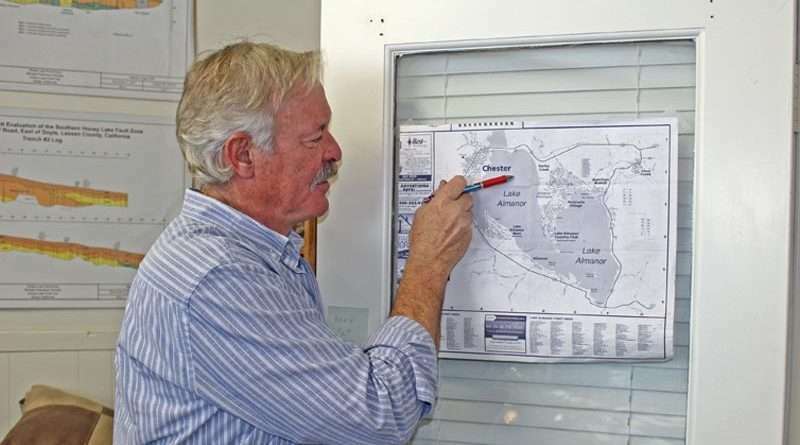 Charles Watson is a registered professional geologist by trade and president and chief geologist of Chester-based Advanced Geologic Exploration, a full service geologic consulting firm with a specialty in volcanology. Under Watson’s expertise, Advanced Geologic provides information on earthquake activity, and publishes results both regionally and globally, along with a weekly earthquake report submitted for publication in all Feather Publishing newspapers. To better understand why earthquakes occur in our area, Watson explained that Lake Almanor lies close to a “unique junction between three large geomorphologic land masses,” called the Sierra Nevada, Modoc Plateau and the Cascade geo-provinces, “all related to the formation of Mt. Lassen Volcano,” which has erupted on and off over the course of 3.4 million years. (In modern times the largest eruptions of Lassen Peak have occurred between 1914-1922, but these volcanic flare-ups have been relatively modest in size). The Sierra geo-province is composed of so-called basement rock, he said, while the Modoc Plateau consists of an ancient basalt floodplain that extends southwest from Oregon. The Cascade geo-province is associated with volcanic material that’s connected to Mt. Lassen Volcano. The intersection of the three geo-provinces creates fault zones under Mt. Lassen — the southernmost active volcano in the Cascade Range in the Western United States — forming a large region of pervasive fracturing. To illustrate just how much thermo activity persists under the volcano, Lassen Volcanic National Park, visited yearly by thousands of tourists and locals alike, is rich in hydrothermal sites like Bumpass Hell and acres of bubbling mud pots. Because the earth’s crust is relatively thin at this juncture, Lassen Peak and the north section of Lake Almanor can easily fracture, resulting in earthquakes large and small that can create conduits for magma to flow to the surface. Usually sizeable earthquakes do not lead to lava flows in our area, Watson said, at least not during the past few centuries, but they can and do shake our region vigorously nevertheless. The two fault zones intersect at Lake Almanor to create the dropped basin — or graben (in geology, a graben is a depressed block of the crust bordered by parallel faults) — that formed Big Meadows, a lush meadow which was later flooded and turned into Lake Almanor by damming the North Fork of the Feather River in 1914. Before the lake was formed, the graben was predominately created by glacial outwash from several glacial periods that eroded the region in the last million years or so and filled in approximately 2,000 feet of the valley with rock and silt, just below where the town of Chester is now located. “Our area is a classic example of fire and ice,” Watson stated. A number of fault lines exist in the Almanor Basin. He said the fill acts as a dampener, so only the larger earthquakes are usually felt. 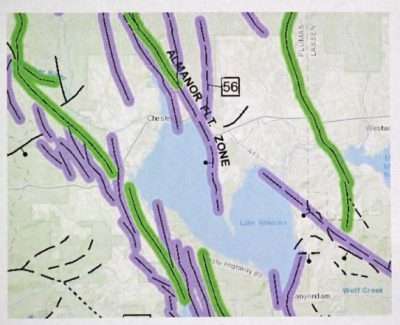 To more fully comprehend how the geology of our region relates to earthquake activity that led to the recent quake, Watson said there is a western and eastern “splay” or slope to the southern Almanor fault zone, which crosses Highway 36 at the North Shore Campground by the causeway and extends under the west arm of the lake, while the eastern splay crosses the highway at the base of Johnson Grade, extending southward and along the western shoreline of Lake Almanor Peninsula. “The type of motion on the Mohawk fault zone,” stretching from Greenville to Lassen Park, “is principally a strike-slip (side-to-side) movement,” said Watson. “It is likely that the 2013 magnitude 5.7 earthquake was on the Mohawk fault zone which caused millions of dollars in damage,” he said, adding that a PG&E study found that this particular fault zone is capable of major earthquakes, potentially ranging from between 6.0 to 7.0 or higher on the Richter scale. Watson added that the southern segment of the Almanor fault zone is seismically active as well, featuring an up-down motion where the latest quake occurred on the western splay of the fault zone, which has produced some large earthquakes in the past 13,000 years since the end of the last Ice Age. Watson said, “My studies have indicated that most of the largest earthquakes around here have occurred prior to 5,000 years ago,” with a few exceptions since then. During the past 41-year period (the time since detailed seismic monitoring began in the region), the Almanor fault zone has generated around 600 earthquakes registering a magnitude of 1.0 or greater; 16 earthquakes measuring a magnitude of 3.0 or higher; with the largest earthquake recording a magnitude of 4.3 on June 2, 1989, centered just off shore from Prattville. Despite the fact that volcanic activity and earthquakes in our region are often tied together, foretelling when an earthquake would trigger an eruption or vice versa remains unpredictable.